Live the ultimate fan experience at Buffalo Wild Wings in the Brooklyn, NY with wings and endless sports tv. For many people who have allergies or intolerances to gluten, ordering a tasty, gluten-free meal at a restaurant can be a challenge. However, Buffalo Wild Wings® has a variety of menu options for people who require this type of diet. Below are a few of their delightful choices to order at B-Dubs® if you need to avoid gluten. If you’re looking for a shareable appetizer that’s also gluten-free, try the chili queso dip. This dish comes with fresh tortilla chips and warm queso mixed with chili. It’s topped with pico de gallo made fresh at the restaurant. It’s a perfect starter meal to share around the table. If there is one thing this restaurant is known for, it’s chicken wings. Their award-winning, traditional, bone-in wings are delicious on their own. However, if you’re in the mood for a different flavor or spice, Buffalo Wild Wings offers an impressive variety of gluten-free sauces and dry seasonings, including sweet honey BBQ sauce, desert heat seasoning, or a spicy garlic sauce. Your wings will be hand-spun in the flavor of your choosing. 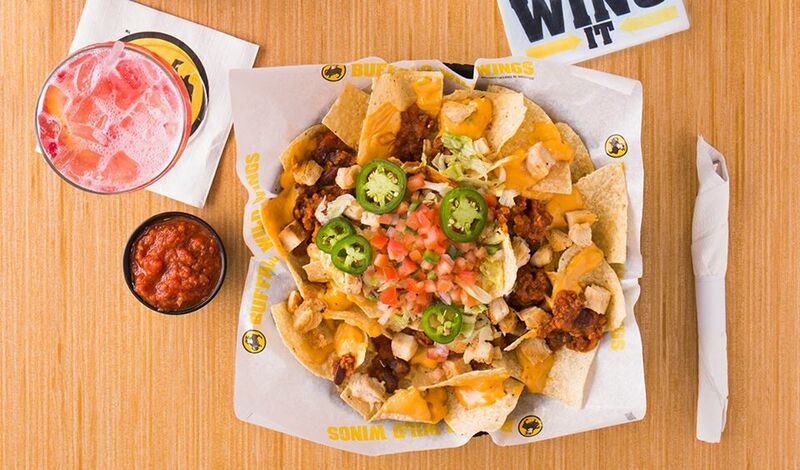 The Ultimate Nachos at Buffalo Wild Wings can satisfy any appetite. Warm corn tortillas are piled high and topped with chili, shredded lettuce, queso, and salsa. This meal also comes with fresh cut jalapenos and pico de gallo. As a celebrated restaurant chain, Buffalo Wild Wings has menu options to satisfy any appetite and accommodate any diet, even gluten-free. Whether you want to sample some of the world’s best wings, a juicy burger, or simply want to sit back with a drink and watch a sports game on a flat-screen television, B-Dubs is the place to be. Head over to one of their New York or Connecticut locations, or check out their menu online today.